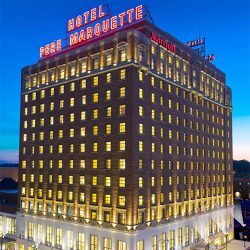 The Peoria Marriott Pere Marquette is the perfect blend of historic and modern. For those looking for a gorgeous, elegant hotel with comfortable rooms, the Peoria Marriott Pere Marquette is the right choice. The Peoria Marriott Pere Marquette is also right in the heart of the downtown Peoria area—giving guests access to a variety of different stores and restaurants. Guests staying at the Peoria Marriott Pere Marquette also have access to a variety of different amenities, including: an indoor pool and whirlpool facility, a fitness center, wi-fi and more. You’ll have everything you need to stay fit, get work done and get some quality rest. When it comes time to eat, you’ll definitely want to check out Table 19. They cook with farm-raised products, and their attention to detail shows in their dishes. Room service is also available. Make sure to book your stay while you are in Peoria at the Peoria Marriott Pere Marquette. Booking Howl2GO Dueling Pianos’ world class show to your Peoria, IL event couldn’t be simpler. From conventions to corporate events, weddings to fundraisers, our unbeatable Dueling Piano shows bring a high energy, interactive show that your guests will remember for years to come anywhere in Illinois!